Faith Hunter has over 20 years in the writing profession, over 20 books written total in over 20 countries. Born in Louisiana and raised all over the south, she writes action-adventure, mysteries and thrillers under the name Gwen Hunter while The Skinwalker series, featuring Jane Yellowrock is taking off like a rocket under Faith Hunter. Skinwalker, Blood Cross, Mercy Blade, and Raven Cursed have released so far with last two becoming New York Times Bestsellers. Another series, her Rogue Mage novels, a dark, urban fantasy series—Bloodring, Seraphs, and Host—features Thorn St. Croix, a stone mage in a post-apocalyptic, alternate reality, urban fantasy world. These novels are the basis for the role playing game, Rogue Mage (2012). A co-creator and contributor to the MagicalWords.net blog for writers, Faith was a guest on SFFWRTCHT last May, and I fell in love with her Skinwalker series. So much so, in fact, that I included it on my 9 Great Urban Fantasy Series You Don’t Want To Miss list, which has been quite popular this month. To read our previous interview at Grasping For The Wind, click here. Celebrating the release of her 5th Jane Yellowrock novel, Faith sat down with me here for a new interview to open her 100 Q&A Tour Of Faith blog tour, the rest of which can be found at http://www.faithhunter.net/wp/2012/08/28/deaths-rival-urban-fantasy-blog-tour. BTS: Nice to chat with you again, Faith. This is your fifth time diving into the minds of Jane, Beast and the imagined New Orleans. What is the appeal for you of doing a series and revisiting characters and locations over and over? Faith Hunter: Thank you so much for having me here again. I had such fun the last time! For one thing, my publisher loves New Orleans! Seriously. And I was born and spent a large part of youth in Louisiana. Many generations of ancestors are buried there (along with the skeletons in their closets) in mausoleums and crypts and vaults. New Orleans was a port city and has long and amazing history to draw upon – hundreds of years – for my long-lived secondary characters. For instance, Leo Pellissier is 500 years old. If I want to go back in time and write a story of his early years, I have lots of historical data to draw upon. Having ongoing relationships with violent, nonhuman predators adds tension to Jane’s stories, and keeps the readers coming back. That said, I do get tired of one setting, which is why some novels, including Raven’s Curse, which came out in Jan. 2012, and Blood Trade, which will be out in 2013, take place in other cities. Also, the short story Cajun With Fangs, which is in the compilation Have Stakes Will Travel (e-book to be released on Sept. 4, 2012) takes place in the very Deep South in a Cajun township and involves all new characters, which helps to keep the series fresh. BTS: What ties the books together? Is there a through line or is it just world and characters? FH: Jane’s life is the series story arc. Her self-discovery, her memories of her youth, which are slowly returning, her love life, and her future are part of that. But also the deadly relationship between the vamps and the witches, and the importance of the blood diamond – the dangerous magical artifact that is in Jane ‘s possession – will play a big part in the series ending. BTS: In Death’s Rival, someone is after Leo’s job as top vampire of New Orleans, and, to top it off, a vampire plague is loose. 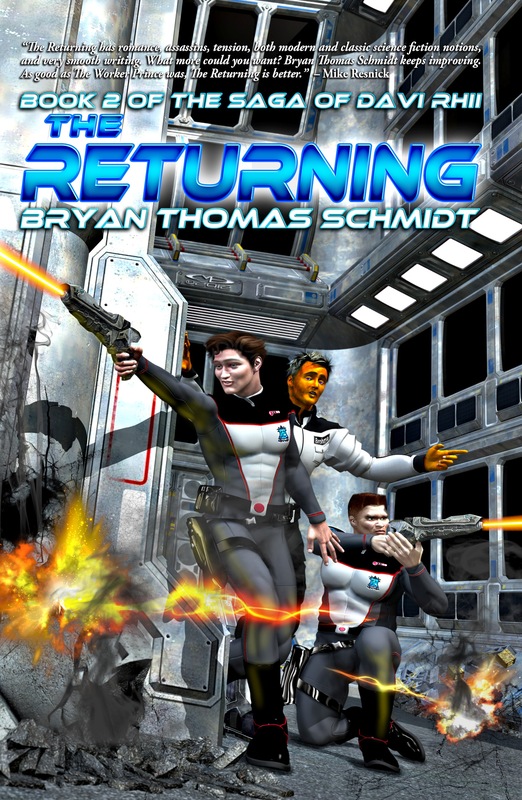 How does your approach evolve with each new novel or does it? BTS: This series is classic urban fantasy with a mix of detective/vampire hunter and some paranormal. What, to your mind are the core elements of good urban fantasy? FH: Good UF is a good mystery with danger to the main character or people the MC loves. Danger & mystery. And a few good fights. And some romance. (nods head) Gotta have romance in there somewhere! BTS: Tell us about your writing office. FH: My desk is set up in my writing room, on the second story of my home. The lot is sloping so I am up in the trees, overlooking a creek. It is a wonderful place to write, though I often turn my back to the window while actually pounding away, to keep from being distracted by the hunting hawks and feral cats and the antics of the squirrels. No music, unless I am writing a sweat-house scene where Jane’s Cherokee Elder friend leads her back to her broken and mostly-forgotten youth. At those scenes, I listen to AmIn (American Indian) flute and drum music. BTS: You told me before you can envision 10 or 15 Jane novels. I know you’re an outliner, or as you put it “I outline wearing pants.” Do you have any kind of plan for those? Idea bank? Story bible perhaps? Or do you just find the idea when you need one? FH: I have a loose idea of how the series will end and I am slowly getting all the clues in place for it. As to firm outlines, I am only thinking one book ahead right now, so no future-story-bible. While I lay the foundation for the series ending, I am having so much fun! BTS: What can we expect from Jane 6 and what’s it called? when will it arrive? FH: Have Stakes Will Travel, the e-book compilation, is out on Sept. 4, 2012, Death’s Rival out on Oct. 2, 2012, and Blood Trade, Ap. 2, 2013. Blood Trade takes Jane to Natchez, Mississippi for fun, mayhem, a new form of vampire she has never seen before, and a lot of interesting men! BTS: What do you want to write that you haven’t been asked to write or haven’t sold to a publisher? FH: I want to do a few more Jane books, and maybe a couple of standalone spinoffs, one with Rick LaFleur as main character and one with Molly Everhart’s witch family. If I can find a publisher for them. The market trends will guide that, of course. BTS: What do you see as the future of the fantasy genre? FH: The future is, as always, seen through a glass, darkly, but I’ll take a shot. I think people in general are very frustrated, so I foresee a lot more fighting and violence in the genre. I predict a new version of vampire, something not done before. I see a lot more historical settings and time periods emerging. And, because people are angry, lonely, and searching, I expect a lot more religion crossover novels. Ex: A character who is both Hindu and Orthodox Christian, and has no problem with the crossover religion, who brings his religion into the story, and the mythos of both affect the storyline and the character’s growth. BTS: What do you have coming up next? FH: The Rogue Mage World Book and Role Playing Game (set in Thorn St. Croix’s world) has been Kickstarted and is in production to sell to fans as I write this. It has Mega Fiction in it! Have Stakes Will Travel is a short story compilation set in Jane Yellowrock’s world, releasing in September 2012. I have a short (yes, it too is set in Jane Yellowrock’s world) in the anthology An Apple For The Creature (headlining Charlaine Harris) releasing Sept 4, 2012. 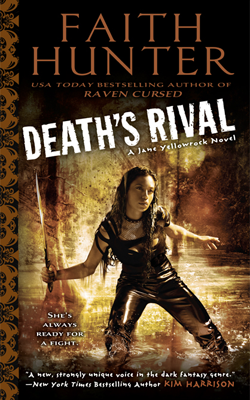 Death’s Rival will be out in October 2012, and it takes Jane deeper into her own Cherokee past as well as introduces a new story arc for the series. The cover copy says it all! Faith Hunter can be found on Twitter as @hunterfaith, via her website at http://www.faithhunter.net, via www.magicalwords.net or on her official Facebook page at: http://www.facebook.com/official.faith.hunter. Be sure and check out the rest of her blog tour stops and the tour schedule at http://www.faithhunter.net/wp/2012/08/28/deaths-rival-urban-fantasy-blog-tour.